By now you probably have a good idea of what it means to eat healthy. Fruits and vegetables get the top score, followed by whole grains, protein and even dairy. A good resource is the American Food Guide, which helps clarify serving sizes. But sometimes it gets tricky to eat well and we often fall off the bandwagon and over-indulge. Maybe you’re a sucker for sweets, or can’t go a day with a diet soda. Whatever your guilty pleasure, moderation is always key. But there are certain foods that not even doctors will eat, and you shouldn’t either. Here are some foods that many doctors have sworn off, and you should consider eliminating from your diet. Whether diet or regular, soda has come under much scrutiny. Soda contains high amounts of sugar. One can of soda (12 fl oz) can have about 39g of sugar. Consuming a can of soda every day a year can add on 14,235g of sugar – but let’s be honest it’s rare that we stick to just one can. Over time, this can lead to weight gain and health concerns, especially if you’re not exercising or eating well. Soda beverages become more harmful as we age since they can contribute to diabetes and even cardiovascular disease. And frankly, for a beverage that doesn’t offer any nutritional value, is it all worth it? If you drink soda for its caffeine content, there are healthier alternative such as tea or coffee, which can offer health benefits. We should be hydrating our bodies so your best bet is to stick with water. If plain water doesn’t appeal to you, remember it can be infused with fruit to enhance its flavor. This includes chicken, potatoes, even fish, basically just about anything can be dipped in a deep fryer to give it a golden, crispy exterior. But fried food is incredibly bad for our health. Not only are fried foods fatty, but they can contribute to heart disease, cholesterol and hypertension. The Harvard School of Public Health suggests that fried food has been linked to diabetes. By following 100,000 men and women for 25 years, researchers found that those who consumed the most fried foods (at least once per week) had a greater risk of developing diabetes and heart disease. Consider baking your food instead. Not only can you achieve the golden, crispy crust, but you remove harmful oils that are often used for frying. Sometimes making a sandwich is the easiest meal to put together. By slapping some processed meat and lettuce on two slices of bread, you have a meal that can cover off many food groups. While some people will opt for slices of turkey and chicken as lean alternatives, the majority of processed meats share one common ingredient: Sodium nitrate. Sodium nitrate is a preservative commonly found in many lunch meats. The Mayo Clinic reports that consumption of this ingredient can increase one’s risk of heart disease. This occurs because sodium nitrate can damage blood vessels which can contribute to heart disease. Sodium is also harmful to the heart because it can raise blood pressure. So if you are already at risk for hypertension, it’s best to steer clear of processed meats. Additionally, many processed meats contain parts of the animal that normally would be thrown away. Processed meats don’t offer much nutrition. If you can’t go a day without a sandwich stick to slices of rotisserie meats or organic lunch meats. They contain less preservatives and more real meat. This one may break your heart – literally and figuratively. The love and craze for bacon is still on the upswing, but you should be wary of this breakfast favorite. 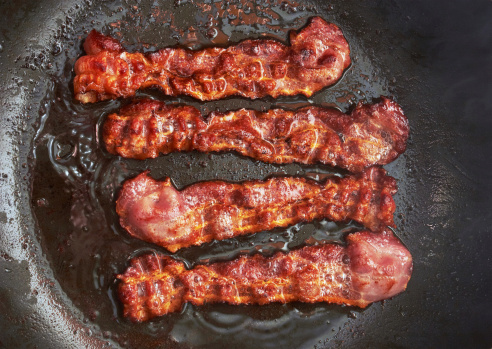 Bacon contains fat and cholesterol that further contributes to your own. And like processed meats, it often can contain sodium nitrate. Additionally, bacon is typically fried in unhealthy fat further making it a threat to your health. If you still want to enjoy the pork strips, try baking it instead. These are just four foods that doctors wouldn’t dare to eat. Now that you are made aware of their health consequences, you may want to minimize their consumption in your own diet as well.